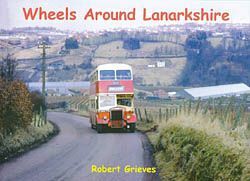 This 18th Scottish book in the Wheels Around transport series covers the diverse county of Lanarkshire from its industrial North to its attractive rural South. The authors personal recollections add colour (in the case of SMT buses, the colour red) and anecdotal information to the very informative captions. The stunning photographs include one of the first automobiles in the country built by J. and C. Stirling in Hamilton, a 1920 Royal Enfield motorcycle, a 1908 Halley motor wagonette with some very chilly passengers and numerous early examples of the enterprising charabanc operators who plied routes throughout the county. Trams, heavy haulage lorries, trains and cars from the impressive 1926 Buick tourer to the diminutive 1927 baby Austin are all pictured here. The detailed historical information accompanying each photograph is enough to satisfy the most ardent enthusiast.